There comes a time when you are looking for avenues to stay motivated even for things you love doing. To me, I was mentally stung by a phenomenon called ‘writer’s block’. The word here is ‘zeal’ and that was missing since the beginning of August. I could not put words and form sentences for extended periods of time. Days became weeks and weeks stretched to months. I had to do something to get over this ‘hurdle’. During this struggle, I came across a course called ‘Connect using Mindful Storytelling’ early November. I was hesitant to sign up for the course and I am not sure why. I looked at the course again after two days. And, this time I signed up. I was looking forward to the course, to become more aware as to why I write. Will the course provide me with a solution to get over the wall? I certainly hoped so when I enrolled. The words ‘mindful’ and ‘storytelling’ had a profound effect on my thinking. I took some time off from my daily chores and had a conversation with myself. Alas, last week, I found the ‘mojo’. In a matter of minutes, words came naturally and importantly, my voice was being documented. It resulted in an article. Few days later, out came another article and a short story. All this, a day before the course. “Do I need to attend,” was the question that occured to me. I ruled in favour of the course. I sensed, I might learn something new, a different perspective, now that I have re-discovered my touch towards writing. Yesterday, I attended the forum with an open mind. The only sure thing about the course was that, I would meet Caitlin Krause and hear her perspectives about storytelling. And, not just that. I can tell you how they got their names, at least their first names. Storytelling is not about paying attention alone. It is about making a connection, to what’s happening around us. Each of us introduced to the others in the room with a personalised etymology game – origin of our names, not just theoretically, but with a touch of personal element and the flavour of dramatic license. Result – the names of the participants are etched in my memory. There were many other interesting topics we covered in those 150 minutes, personally I came out of the room with renewed confidence. I was lost only to rediscover myself. This is a story about two Indians meeting in Geneva in the 1960’s. He came to realise his dreams while she, when her dreams were shattered…..
Akira was tired of having fleeting relationships. She had no choice and was frustrated about the pool of boys available to have a conversation. Shy, intimidated, boastful, chivalrous……. and relentless, not her type. The wait ended when she met a ‘likeable’ guy and they found a good company in each other. Two years, that’s when the expiry date came about to their relationship. The talks of mutual separation were cool; however, it was hard on those 22-year old college pass outs. Akira turned to her mother Jaya, who was all ears about her daughter’s life. Jaya had to update herself with the latest meaning of the term ‘break-up’. The conversation between mother and daughter had shifted from kitchen to their garden. Mamma, that’s how Akira called her mother had just brewed a pot of ‘masala chai’. Akira was home sick and it was evident from the tins of ‘home made cookies’ and few salted savouries, she brought along to the patio. Tears rolled on Jaya’s eyes as she recalled the times when she and Akira’s Pappa spent their evenings walking along the shores of Lake Geneva. Jaya flew outside India for the first time to Lausanne, Switzerland. She was one of the few students from India selected to be a part of the master’s programme in hotel management at the prestigious Ecole hôtelière de Lausanne. During her internship, she was part of the group that catered to a large gathering of diplomats at the UN convention in Geneva. It was here Jaya met Akira’s Pappa for the first time. Jaya, in her youth was vivacious. She was doing a favour by taking his mind off the impending speech. Not, just that, she was equally curious about this young Indian who appeared smart, though a touch nervous. She hoped, it would be a yes! Jaya eagerly listened, “However, I have made a mental note, Jaya. And it would be a pleasure to catch up with you,” and nervously went back to the speech papers he was holding. It was a yes as far as Jaya was concerned. Their conversation was interrupted when a colleague of Girish’s asked him to come inside the auditorium. Girish was at the convention to deliver a lecture on his research findings about the need of empowering house wives and women. It focussed on giving financial assistance and other aids to the small-scale industry schemes in developing and under-developed countries. The United Nations had conceptualised the event ‘Great Minds, Great Ideas’ to attract ideas in a forum where countries could exchange best practices. Girish was representing India and those papers contained his vision and a proposal for his idea. “Good luck, Girish,” Jaya smiled and hoped they could meet up for a coffee at the end of the programme. The forum of Great Minds, Great Ideas was a great initiative. Girish felt when ideas from different societies and economies merge, it will have a positive influence in establishing collaborations and the necessary infrastructure to realise development projects. His towering appearance in a navy-blue suit with white shirt and a dark blue tie masked his nervousness to an extent. Girish stumbled a couple of times, but overall managed to cover his idea to the audience, which had gathered from all over the world. “Thank you, sir,” he paused for a few seconds, collected his thoughts and was ready to answer. The audience applauded Girish’s response. Though, his visionary idea was good – but most of them could not connect with him. It was confusing times in the 60’s. A winner had to be chosen and in the times of war and arms, the idea of ‘disarmament and the ecology movement’ won the award. This idea went on to become ‘Greenpeace’. Girish was visibly disappointed – however, he knew the world must get rid of its desires to fight battles, wage wars and kill lives and destroy our environment. It was early June. The light was bright and he didn’t have any mood to network among the people gathered at the apéro. Although the audience from other parts of the world wanted to catch a glimpse of Girish, after all he did have a worthwhile idea. After two hours of friendly exchanges, Girish decided he would return home. Just as he made his way to the exit door, he thought about Jaya. He made his way to the corridor where they had first met. Jaya had just completed her work for the day though she was still in her business attire. She was visibly happy that Girish remembered her. “Give me ten minutes, will you? I will go change and then inform my manager about having completed my tasks,” Jaya said with a smile. “Sure, I will wait for you here,” he was yet to come out of the disappointment. Walking helps to come out of disappointment. He decided to walk along the long corridor to move on from the talk. Girish saw an interesting poster that read – ‘Premiere Festival de Jazz Montreux, 16-18 June, 1967 at Casino Montreux’. He had a good taste for music and wondered if he could make it for this grand event. Girish’s fascination for Jazz came from the Hollywood movies that showcased a lot of Jazz artists. Girish was paying attention to every detail on the poster and little did he realise how those ten minutes went by. She was anything but formal in attitude and that went well with her attire, without the double-breasted jacket and that funny looking toque blanche. “Would you like to join us in two weeks’ time for this Jazz festival?” – Jaya asked. The reticent Girish just did not know how to answer. In fact, part of his behaviour stemmed from the fact that, he had never met a girl like Jaya before. She was direct, devoid of shy whatsoever, very contrary to that of Girish. “You are to the point, aren’t you?” – Girish replied. “Yes, that I am” – remarked Jaya. “And, you talk a lot!”, Girish was warming up to a conversation he never had before. Girish just nodded and didn’t add any words. There was an air of silence as they walked towards the main door which led them to the old streets of Geneva. “Old town Geneva has some good cafés; do you know any in particular?” – Jaya, again, unable to bear the silence. “Oh, you poor child. Missing home, is it,” Jaya was at him again. Jaya’s response was too direct for Girish and he wondered what was the meaning behind her statement. Another round of silence…… and again, Jaya resumed their conversation. “Aren’t you curious about what I said,” she was one of her kind. Jaya smiled and Girish too had a pleasant grin on his face. Jaya showed Girish a nice coffee shop and they both decide on that. Lake Geneva was on to their right. “Je voudrais une tasse de café noir” and the waitress then looked at Girish. He was clueless and had not invested enough time in learning French. Jaya stepped in and asked Girish, what would he like to drink? A black coffee or a milk coffee? “Milk coffee for me” – Girish replied softly. “Une tasse de café au lait pour le monsieur” – Jaya ordered on behalf of Girish. Jaya paused for the first time, she looked right to the sight of Lake Geneva and a few seconds later she resumed. She turned towards the lake and paused again. This time her silence was longer than few seconds ago. “They just hugged me and didn’t utter any word. They had lost their son and daughter-in-law and I had lost my parents. All three of us wept for the common loss of ours – a loss that would be irreplaceable,” and she again turned towards the lake. The waitress came with their orders – placed the black coffee in front of Girish. “Excusez-moi, je suis très désolé.” – the waitress realised her error and quickly placed the milk coffee in front of Girish. Another round of silence……both had not touched their cups. Jaya was back to staring at the lake. Girish looked at Jaya and didn’t know what to say. He was short of words; he was confused and didn’t know how to proceed. And, quite instinctively, he placed his hands over her. Jaya turned towards him – “I am sorry for your loss,” he said it with empathy. A few seconds later, he slowly removed his hands and waited for her to react. Probably, his instincts were right, Jaya brushed aside the thoughts she was caught up a few moments ago and took the cup of coffee from her right hand. They sipped their respective coffees, and in between no words came out of their mouths. It seemed like they didn’t prefer talking while having coffee, or was it a uncalled break in their conversation? All one could hear was the ‘chat’ coming from inside the restaurant. It was about 8 pm and most of the guests had finished their dinner and were bidding ‘au revoir’ to their friends. Girish and Jaya sat silently just as the music started playing. A pianist seated inside began the evening with the instrumental version of Herman Hupfeld’s masterpiece, ‘As Time Goes By’. This song caught everyone’s attention when it was used as a leitmotif in the 1942 romantic drama Casablanca. Just like Sam in the movie, the pianist too played the piano in D major and mixed it up with B-flat major. The B-flat major reminded Girish of Frank Sinatra’s version of ‘As Times Goes By’. The song suited the mood perfectly and they both sat in silence and not looking at each other. Girish was looking at Jaya and she looked back at him. None gave away anything and in the background, they could hear…. Jaya held Girish’s hands which were on the table without looking away …. There was a moment that swept them while ‘As time goes by’ was playing in the background. And to add to this, Girish uttered those lines – “The world will always welcome lovers,” Jaya pondered and didn’t know what to say or how to react. The ever-chatty Jaya had gone into her shell and remained there. “So, where do you live?” – Girish asked Jaya. He deliberately changed the topic to make her feel at ease. He was now with a girl who remained silent, someone very different to whom he had met earlier in the day. “I live in Lausanne, a few thousand meters away from the lake,” she pointed in a direction. “Do you like it there,” the change in topic seemed to reignite their conversation. She looked at the lake and pointed far away – “There, I am not sure if I am accurate, but I stay that far away” and she laughed. Girish felt a touch better when he saw her laugh. It had been a heavy forty minutes or so and he knew he had walked on tricky waters when he heard her tragic story. But he got an impression, it was half the story. Girish sensed there is more to it. Girish felt it was best not to dwell in her past further. At least, at that moment. Apéro was not his thing. Bowls of olives, assorted Swiss cheese, nuts, pickled cucumbers, chips and few meat sandwiches weren’t going to fill his stomach, the way he was used to. In fact, it made him a touch irritated as it wasn’t the perfect appetizers either. “How much can one chew nuts or cheese before dinner,” Girish visibly upset. She had resumed her bubbly-ness, “Wait, maybe we can have a look at the Genève-Gare. There might be something to eat,” Jaya led the way and asked for the waitress to bring the bill. What can a vegetarian find at 9 pm in a train station in Genève? It was a rarity for a person to not eat meat in this part of the world. But there he was sticking to his beliefs and policy of remaining that way. Jaya understood where he was coming from and didn’t advocate him. Jaya shifted to eating meat when she found it tough living in Lausanne. Girish by now had demonstrated he was not flexible when it came to altering his food habits. and suddenly both their faces expressed different emotions. Her face went a bit pale as it was not so long ago she remembered her deceased family and now those happy memories came back again. What is the point in having such memories, when you know you cannot relive them? Why can’t one just forget about it and move on? Why moving on isn’t easy and needs effort? Why should we struggle to feel better? Those thoughts must have crossed Jaya’s mind innumerable times in those last fifteen months. No matter what one says about moving on – it is like climbing a peak. One must take it one step at a time to conquer the peak. And to those hard-felt feelings, one should keep living the day as it presents and fill with fresh memories, that way old memories no longer hold you back. “Look what I found” – Girish brought Jaya her back to the world. She was lost in her thoughts while he was busy looking for some food. Girish held a baguette which had cheese spread, three slices of tomato, few lettuce leaves and topped with mustard sauce. He would have preferred ketchup – but some sauce is better than eating bland. She pointed her right index finger to her stomach and indicated she was full. Jaya laughed a bit more and she had completely gotten off her thoughts. While Girish’s eyes were on the baguette, she looked at him in a strange way. She appeared lost, again – but this time it was different. Jaya was lost in the present, looking at him, his entirety, which was a bit more casual with his coat neatly folded on his left hand. His tie was off and an unbuttoned shirt. Jaya gazed at him and occasionally he looked at her while chewing, making gestures as to ask what was she thinking? She nodded as though it was nothing. When a woman says nothing, it means she doesn’t wish to share. One needs to prod more and gently make her feel at ease. Then she might share what was on her mind. Try you luck, it is not a guarantee. Perhaps, she wanted those thoughts to remain just with her, closed in her secret garden where many such thoughts are stored. What is the use of such thoughts that remain only with you? Will it come in aid when times are different from what you are experiencing right now. Is life all about collecting such memories and keep storing so that someday they come back and give us solace? What if the meaning of those thoughts change with time? “At least, I will drop you till your platform,” he insisted. Jaya didn’t say anything and they walked slowly towards the platform. The day had been tiresome to her – physically and emotionally. On one side, she met Girish and they spoke a lot and on the flip side, she spoke about a few things that made her touch sad. Mixed emotions! They saw a drunkard seated on a bench and he was cleaning his mouth organ. He was in no state to play music or so, they thought. Within seconds came a rendition of French performer Edith Piaf’s ‘la vie en rose’. The organist wasn’t just playing, he was conveying a message, a deep one. Not sure what was his exact state of mind, but the sound had a profound effect on people in the vicinity. Girish got reminded of Audrey Hepburn and her rendition of ‘la vie en rose’ from the movie ‘Sabrina’. He stood puzzled just as Humphrey Bogart in the movie. The day was meant to be about his talk, but there he was, a few hours later, his thoughts far away from his vision to empower women in the developing and under developed countries. Life is funny, if you give it a chance. Girish didn’t know how to put those feelings away he has for Jaya. In 2013, after an unsuccessful year to find a permanent job, I went back to old ways i.e. freelancing. Freelancing = travelling in my line of work. To me, working in different projects as a freelancer accelerated my ‘learning curve’ and that became my definition of ‘growth’. However, in mid-2014, I was in a fix. I went with my gut feeling and remained in Zurich. That happens to be one of the best decisions I made, in hindsight. In Zurich, I started taking up few freelance roles and at the same time decided to pursue my lifelong hobby of fact collection. I felt, it was time to make that ‘past-time’ into something meaningful. There were no ‘plans’, it was purely ‘on-the-go’. Inspired by the above Edmund Burke’s saying, I came up with the term #FactFood for the daily nuggets of information. Through Qwizzeria, I found an avenue to channel my interest for collecting information and presenting it one at a time, every day. This allowed me to get into a learning process through ‘researching’ and ‘fact finding’. By giving a fact, I was learning more. Qwizzeria turned two last week and so far, has produced over 736 fact foods. The daily routine continues to enrich my experience about many aspects about the world – it is making me understand different cultures, have meaningful conversations with people and mostly, it has been a humbling exercise. The more I dwell on random topics, the more I realise, how less I know. Qwizzeria is an integral part of who I am. However, I am interested in other fields of work. I started a consulting firm early this year that focuses on sports consulting, event project management, content writing and Qwizzeria completes it with knowledge consulting. I love reading and for a while I had lost the zeal because I felt it was a waste of time assimilating all the information. In short, I was getting drowned with information and with Qwizzeria, I have given myself an opportunity to water my brains with knowledge. Now, think about getting paid for what you love to do? There are no big pay checks yet, however the start has been promising. Now, it is up to me how I take it forward. Being a parent for more than a year has given me an unexplainable confidence. And, I have an understanding partner, who is an excellent devil’s advocate and at the same time knows when not to be an advocate at all. This journey is a realisation in progress – it is ok to be demotivated, confused and distracted. I am a human and things aren’t rosy at times even when I am doing what I love. It is like losing my way in the right direction. In such moments of uncertainty, the core of Qwizzeria came to my rescue. One day at a time, one fact a day, that’s all. Next time, when you are asked to believe in the power of one thing at a time, or one day at a time; Trust me, it is for real. My advice is, embrace those feelings and make that journey irrespective of the nature of the task. Because you learn, therefore you are! Qwizzeria is a knowledge consulting project based out of Zurich, Switzerland. Write to me – rajan@qwizzeria.com to know how Qwizzeria can engage with your stakeholders be it with learning modules, Knowledge transfer exercises or hosting quizzes. This topic, globalisation has been pegged into our minds ever since ‘connecting people’ was eased through digital media revolution. With the increase in the number of ‘social networks’, one felt like we belonged everywhere, and it even gave a sense of what the ‘world’ is like. Many views, couterviews and opinions, we heard it all and took part in it. What about the opinions that never came out? Are we listening to the silence? As our feeds are filled with the ‘latest happenings’ around the world, we often tend to overlook a crucial element to society’s existence – localisation. Human race is made up of societies and societies, whether we like it or not mirrors the principle of Newton’s third law – ‘For every action, there is an equal and opposite reaction’. Globalisation was one such action/reaction that could not have escaped from our human evolution process. It had to happen someday, and here we are experiencing the phenomenon of this global closeness. Naturally, there was bound to be a reaction. Economics dictate countries and the way it grows. But, who dictates the economics? The societies made up of people make these choices based on their ever-changing surroundings. The beliefs, however firm are tested each day, and to maintain an equilibrium, one must constantly tug-it-out in a field of action-reactions. I often wonder, if our evolutionary path is a straight line, wherein we move forward, rest as we please and have an option to go back? Is it a case of being sinusoidal, where we have our positives (peak), negatives (troughs) and a neutral path? Now, on the back of Brexit and Donald Trump’s victory, all I can think of is, people who vote may not voice out their opinion publicly. Maybe, they have had enough of globalisation. Are they tired of world-closeness and hence they took a stand to focus more on the matters that are part of their immediate surroundings? It defintely looks that way! Privacy is no longer an inexpensive choice and the concept of ‘globalisation’ isn’t well defined now. In a chaotic world, what would you choose? This is a choice, majority of them made to back ‘localisation’. And, in a democratic process, a simple majority is enough to win! Whether this is an action or a reaction – it doesn’t matter. Life goes on…. C’est la vie…. We have lived before… we are living right now… and we continue to live in the future. We will continue to find ways and that is the core of human’s existence. He knew it from the beginning, his destiny was elsewhere. He was not to be confined to the ties of being a family man – call it Buddhaesque. He left his family in search of enlightenment and enrolled himself among his habitat’s most recognised ‘Band of brothers’ unit. With time he marched on from one assignment to the other and the clarity he wished to seek was far-fetched. He met many people at various engagements, rubbed shoulders with senior members and steadily progressed through the ranks to become one the recognisable, hardworking persona brimmed with confidence with an attitude of a leader. A mortal nevertheless, he still needed timely guidance especially when he ventured into a new breed of responsibility. A crisis erupted and he was out of his comfort zone – he wanted to do good, act well and in desperation reached out to his seniors and other colleagues working with him, to his surprise they suggested the ‘wait and watch’ approach over taking any actions. Hindsight would teach him what not to do rather than what to do. Both factions involved in the crisis suffered. It wasn’t the time to slogan “We didn’t start the fire” – yet the affected parties continued blaming one another. It was always burning. He knew what was happening, however being the lead for a group meant he lost the freedom to exercise his thoughts, articulate his personal views and debating was an option turned down. He was new to the job and he didn’t explore what he didn’t know. Silence was not the best policy – but it gave him time to introspect, live with his own thoughts when opinion makers, his opponents and the affected group(s) questioned him, ridiculed him and branded him as though he was the sole responsible person for the crisis. They would have been better off adopting his method of introspection. Alas, they didn’t. Seconds ticked, hours clocked by, days went by, months passed by and still he was pounded for answers. He was still in introspection slumber on the crisis and all he did was take the advice of his colleagues to not air his views. In a couple of years, he had found peace with himself on the crisis and wanted to share his views – but people had moved on. Sooner if he didn’t, he would lose the plot again. He started to run faster, work harder than anyone else he knew. He dedicated himself to have answers when questions were asked. In other words, he came out stronger from the crisis. However, deep down he was affected. At the remotest part of his soul, he knew he still had to vent out his views. He was often reminded by his inner voice about younger days, his decision to move out of family, events that led him to his present. Those memories fueled him to make a difference, etch a name for himself, and bring in progress for greater good. Success followed and there was a limit to what he had achieved in the area he was initially assigned to. It was natural to move on to the next level. He set his eyes on greater leadership roles. At the same time, his group saw the potential he had, and sailed along with him, pushed him, projected him to be the panacea of all sins that existed. And they began building a new foundation unknown to him. He came through convincingly purely on merit and not relying on recommendations or any sort of prejudice. He had reached the top and now he had a clear view around him. Did the clarity he was seeking many years ago came out of the blurry state? Being ‘the’ leader was a new experience and the only way he could move forward was to learn on the job. It happens to everyone, but few admit it. Being perfect is a limitation and an illusion – he discovered this soon and hinted to his followers many times, they missed the point repeatedly. The path ahead was not easy, and it forced him to think whether he should change his set of beliefs? This dilemma played as he encountered acts of discord regularly. This was certainly not what he expected after getting to the top. He thought he could deliver solutions at ease. Problems piled on endlessly. That’s what responsibilities can do, they allow you to re-think endlessly to come up with better solutions each day and never allows you to settle. He often recollects the chain of events from history, of his forefathers, and of personalities from his contemporaries. This serves his appetite for introspection, to analyse whether he is taking a step forward or going backwards? and how many from his group truly believe in his cause? He is now the senior leader, those days of consulting with the hierarchy was over. He finds his comrades are at a different level and to an extent oblivious to his beliefs and the direction he wishes to take. Slowly, many of them are branching away with their own set of plans. He wishes to address this, however he is quickly reminded about the bigger issues at hand. They don’t realise he knows his comrades have become those issues. A lot of his comrades and supporters believe they are fighting for him, but do they know it is not the fight he wants them to focus? When will they listen to him? Will it be late and at what cost? He is surrounded with many moments of uncertainties, and he is stuck whether to embrace them or ignore them. Those feelings of hope and disgust mix dis-proportionally to his deep thoughts and clouds his decisions. And one day, he woke up to see, he is trapped. What was unknown became obvious. He allowed his comrades to build a fortress of solitude around him. Was this the reason he left his family at a young age? Is this how he envisions his future life? There is no right or wrong time in making decisions. Similarly, there is no right or wrong moves as no matter what he does, he will remain popular among those who worship him and unpopular for those who cannot stand the group he represents. He has reached that stage. But, mortal he is, he fears his inaction might haunt him even more this time around. Should he keep quiet again and remain in that fortress and trust his comrades? Far from the fortress, each day there is a clash of ideas even if the resultant goal is the same. Some play the moles, leaving them aside, shouldn’t ideas leaning towards the same goal be one and function like a Justice League? The events that shaped our present cannot be altered – why are we trying so hard to change it? In the meantime, he in his fortress and is constantly assured everything is under control. Mortal, that he is, he thinks about his legacy. He asks how would i like to be remembered by future generations? That’s the question he needs to answer and sooner it is, the better. He needs to re-visit those moments when he took some of the boldest decisions that shaped him. And in some scenarios, he needs to remain true to what he believes instead of merely going where the wind. No matter, how hard he tries to create an effective pack, he will be deserted. He is a lone wolf and that’s his destiny. If he manages to inspire the pack to follow his lead and live out his vision – it will be his legacy. It’s been more than five days since I watched the movie ‘Rangitaranga’ – a Kannada movie which has been the talk of the town among the Indian cinema lovers. I was one among the 80 adults who watched the screening in a small Kino in Zürich. True to its hype, I loved the movie as it had a link to my childhood – a distinct theme that forms the basis for the movie which is recurring (on my mind) from the 90’s tele-serial in Kannada, Gudada Bhootha. The movie was refreshing in many ways and my thoughts on the same. ‘Rangitaranga’ (Colourful wave) – a word that will soon find its way in the Kannada dictionary is a well-thought out movie and the title justifies to a large extent about how different moods of a human being is identified with certain set of colours. Songs with matching music and lyrics penned entirely in Kannada/Tulu remains the best side-kick of the movie. The background music mixes well with the visuals and we are in a maze right from the moment movie begins. To get a psychological-mystery (thriller) right requires a master screenplay and attention to details as various thought processes connect the characters with the story to take it forward. If ‘why’ isn’t part of your thought process while watching the movie, then you have missed something! When taken in isolation, every character has an element of ‘mystery’ barring the antagonist…until the dying minutes of the movie. The ending of the movie was abrupt and it left me with more questions than answers to those mystic puzzles found in the movie. The antagonist came in as a surprise element (kudos to that!) and credit to the writers to have treaded a unique path leading up to the climax! Unlike most movies, I rate movies highly if it has the ability to make me think and have some strong discussions on the same. One such unsettling feeling I have from the movie is the way they revealed the antagonist and his role in the entire movie. In spite of very well penned sequences – the shades and the background for the antics of the antagonist lacked material, sophistication and instead it was hurried upon to close the gaps the story had created thus far. Was it a case of wearing a ‘mask’ all along or a medical case of ‘bipolarity’? In the defence of the movie-maker – a movie isn’t a great platform to explain things unlike say a ‘book’ or a mini-series. However, paying attention to the ‘climax’ must never be overlooked and I would say, instead of two back-to-back songs that comes after intermission, there could have been elements added in the movie that provided depth to the ‘character’ who’s end meant, the puzzle was solved or was it? Looking back, a great opportunity would have been when the Yakshagana scene was shot, an event which the hero Gautam attended. The antagonist could have been shown with fervour – a slight hint to his traits of being the ‘Uttama Villain’. Instead, it can be seen, many deliberate attempts were made to conceal the ‘truth’ and plot frequently misguided our thoughts. While Gautam was engrossed in the show, our mask man was busy plotting something else. Coming back to whether it was a ‘mask’ or ‘bipolarity’ – the antics of the antagonist is fine during the day time as he comes across as a poetic, jovial and even supportive on various issues. Was he wearing a mask to go by the day until the dusk beckons to unleash his ‘dark side’? this is in spite of not recollecting ‘the hero’ whom he knew pretty well. Or did he give into his dark side and let his mind loose on hunting down pregnant women – and re-live his first killing each year? As stated, there is a pattern in the movie, July 7th each year and the eleventh day after that, when he unleashes his darkest weapon – his anger and satiates himself by killing the kidnapped pregnant woman. That’s all for the year! What happens to this dark side of his for the rest of the year? Does he wander (as shown in the movie, he does) when he has a bout of depression and the maniac in him takes over? or is it a case of hunting down his prey days leading up to July 7th? The more I think about it, I am convinced it was a ‘mask’ all along and the antagonist knew very well what ticked him towards his beastly side! There are many questions about the antagonist which made the movie incomplete and made me believe, there is a scope for a documentary in revealing the idiosyncrasies of this accused ‘Gudada Bhootha’! Would the movie makers be interested in revealing the actual character? At thirty-six, Tsukuru Tazaki recollects his life he had led up until that point in time. He ponders over his childhood, his time with four of his best friends and about the most testing time of his life at twenty, when the prospect of dying had such a hold on him. Tsukuru, Japanese for ‘the one who make things’ – and true to his name, he had a fascination to build rail stations and that took him away from his closely knit group of five friends and from his family. From Nagoya, his home town to Tokyo where he was to study engineering. Tsukuru thought himself to be ‘colorless’ and an empty vessel and unknowingly was first to blame himself when things didn’t went as expected. Was he justified in thinking about himself in this light? Did he ever seriously consider how others felt about him? Should he be writing scripts for others on his mind? or maybe this is how Tsukuru was wired. Some people write string quartets, some grow lettuce and tomatoes. There have to be a few who build railroad stations, too. And I wouldn’t say I have a passion for it, exactly. I just have an interest in one specific thing. After having failed to commit to any of the girl friends he previously had, it bothered him as to why he wasn’t taking that final big stride. Was he clueless about the immense emotional baggage he was carrying all those years? Why was (and is) he not curious to know why his four friends banished him one fine day, no reason given whatsoever and no intent from Tsukuru to know ‘why’?. And since that incident, sixteen years went by where he led a life which had no meaning whatsoever – but he carried on, walking those steps necessary to survive life. Probably, that is what he is, a survivor and a plain one at it. And he meets Sara, and she at 38, two years elder to Tsukuru fuels a spark which he badly needs. Human traits do not change unless one is willing to change. That way, human mind is a great player. It can play any game it wishes to and all we do is react and act upon it. Within such dexterity, there too lies a rigidity of not letting go of how you view life, being relentless in believing certain things and how it would fail, each time and how you would ensure it would fail because….. it happened in the past and it so must happen. Any room for a change? All his life and specially those sixteen years, Tsukuru tried to hide those unpleasant memories – but deep down it was there, in a dark corner and unknown to Tsukuru playing tricks on how he viewed life and its situations. Sara convinces him why he must revisit his past, meet his four friends and how he must pursue to know ‘why’ he was treated the way he was long time ago. Tsukuru knew he can hide memories for a lifetime, but what about the history that bogged him down, that made him a prisoner locked in a cell. Doesn’t he feel like breaking out? Tsukuru takes a blind leap and decides to re-visit his past. Along this path, he meets his friends and realise, life of others was different from how he had pictured in his own mind. While he was unearthing the past, he finds Sara on a summer evening, walking with an elderly man, holding hands, laughing, which gave an impression that she was very happy. He knew he finally found a girl in Sara with whom he can spend the rest of his life and yet those images of her holding hands with another man bothered him, every minute, every second. He had made up his mind that he cannot give her that happiness, he was colorless, empty and probably that’s the reason people leave him, just like that… abruptly and all of a sudden. And then…. a trip to Finland to meet his childhood friend with a hope that she would fill the void to that ‘history’. Sixteen years later, those feelings of dying came back to him when he returned to Tokyo and he was sure, if Sara chose the other man over him.. there was nothing left for him to live for. His mind was on a brink of a collapse, took him to the darkest of the forest a man could imagine and threatened to unleash deadly elves that would finish him. If he had to lose it, he would rather lose himself. ….. and yet….. he manages to survive!, another battle with his mind. And he realised one thing about himself – in spite of those colorless sixteen years he led. Not everything was lost in the flow of time. We truly believed in something back then, and we knew we were the kind of people capable of believing in something – with all our hearts. And that kind of hope will never simply vanish. 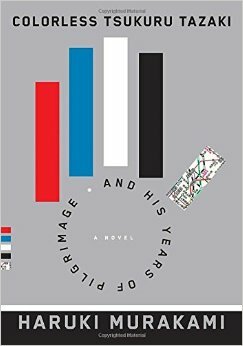 As the title suggests, Colorless Tsukuru Tazaki and his years of pilgrimage – the Tsukuru can be anyone we know and how each one has a story, a unique one because of our thoughts, how our mind processes the same fact differently and makes us to react in a way that makes us who we are. The key to survival is not a set of formulas – but a constant game played on our minds and that game knows no rules!